After quitting his lucrative executive management job, Carr Parker retired to a life of travel…or so he thought. With his best friend, ace pilot and Martian native Mado of Canux, they set off to investigate an area of space that collected wrecked spaceships. One adventure after another leads to a threat of alien invasion, a mysterious creature of immense proportions, and the most frightening encounter of all…falling in love with Ora, the Princess of Europa. Includes all of the Carr Parker stories. Available as a trade paperback, 5.5×8.5in, for $9.95US through all normal retail channels and Villainous Press. 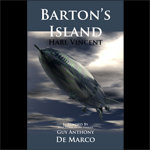 Barton’s Island, written by Harl Vincent, was released by Villainous Press today. In the year 2229, Jerome Carter and his Gang of Ten run the government of United North America from the shadows. With the iron fist of business acumen, they fear only one thing: a leader who can motivate the working class, called the Gray, to revolt. Philip Barton, born one of the elite, is that man. Barton is exiled, along with his wife and associates. What his enemies don’t realize is that Barton and his airship yacht are not all they appear to be. On the run from government agents, Barton escapes to a secret location known as Barton’s Island. Can he elude the thugs from the government long enough to lead the workers of the world to a new era? Available as a trade paperback, 5.5×8.5in, for $12.95US through all normal retail channels and Villainous Press. 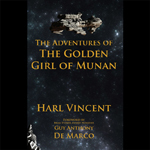 The Adventures of the Golden Girl of Munan was released today in print format from Villainous Press. While working in his lab, Roy Hamilton heard a voice from a mysterious island. A golden voice that warned him an enemy was preparing for war! With his experimental space ship, Roy sets out to save the Earth…and possibly rescue the Golden Girl of Munan. Includes all of the Professor Nilsson stories. © 2014 The Publishing Consortium, LLC. Portions © 1928, © 2013.